In this fantasy world, every year, the violent and oppressive Demon King—the strongest of a caste of people marked by their animal-like appearances—takes eight Paper Girls (of the plain, human Paper caste) to become his concubines. Lei never expected to become one of those girls, but even more shocking was the twist of fate she met upon her arrival at the palace—her unstoppable and desperate fall into a forbidden love with another Paper Girl. When I first heard the synopsis for this book, I was sold in an instant. An own-voice Asian fantasy story with queer girls, demons and half-demons, strong women overcoming forced slavery, and did I mention queer girls—this immediately shot to the top of my “most anticipated releases of 2018” list. Perhaps the gods have forgotten us, or grown bored with our small corner of the kingdom. Because here I am, about to share the last thing I’d ever want to offer the King. There’s a lot to love in Girls! First, there’s the fantasy world and the classes of demons and humans, which were so fascinating. I know this isn’t the popular opinion on this note, but I was a teen right in the middle of the internet’s “anthro” phase and had so many positive memories of that time, so when I realized the demon or “Moon” caste were basically humanized forms of animals (as in people with horns, furred skin, etc. ), I was flooded with nostalgia in the best way. The word itself—home—is a blade in my gut. It’s a call, a song. One I can’t answer anymore. I was also impressed by how in-depth much of the world-building is: we’re given a substantial amount of back story throughout the novel, and rather than dumping it all on us in the beginning, there’s constantly more to learn, even 300+ pages in. This story has a level of complexity that you don’t see often in debut authors, and I enjoyed that so much. The last major positive I want to mention is the entire character design of Wren, one of the other Paper Girls. Despite not being the main character, she was the star of the show for me; she felt the most complex and three-dimensional, and I consistently enjoyed every single scene she was present for. I’m cast in the shadow of that night with the King. The memory of it hovers close, a constant presence at the edge of my consciousness, like moon-shimmer on the surface of a lake. Unfortunately, there were also a few things that caused Girls to not live up to the hype I’d created for it in my own head. First, while the world-building is great, the narrative voice didn’t click well with me. I found it very difficult to immerse myself in any of the scenes, and thought the descriptions of most characters and settings were too general. It doesn’t matter how beautiful the cage is. It’s still a prison. I also struggled with most of the characters, especially Lei. Wren is the only character who felt truly complex to me, but everyone else struck me as predictable, and all of the Paper Girls besides Wren and Aoki felt over-simplified and predictable. There are a handful of lesser characters in the story that I enjoyed fine, like Zelle and Kenzo, but the amount of time we get to spend with them is practically nothing at all. Finally—and this is probably more of a “me” issue than the book, so I’m not really counting off points for it—no matter how much I wanted to root for the romance or the plotting of revenge and justice, I never could find it in myself to really care very much. I’m usually one of the most emotional readers you could ever meet, but the writing simply wasn’t capable of evoking any genuine feelings in me most of the time, so when I finished it, I found myself feeling a little empty and not particularly concerned over what would happen in the coming sequel. All in all, Girls of Paper and Fire is a difficult book for me to rate and review. My enjoyment of the book puts it at a 3, but the important issues tackled and the depth of world-building make it a solid 4.5—ultimately, I settled on 4/5 stars. I’m not entirely certain right now that I’ll be eagerly awaiting the sequel, but Natasha Ngan showed so much promise in this—especially with it being her first novel—that I’m definitely very keen on seeing how she improves and where she goes next in her career. 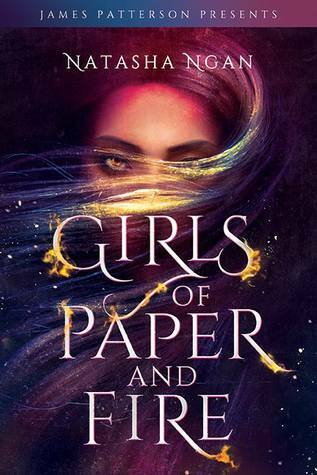 If you’re a fantasy reader who enjoys high fantasy and beautifully done queer rep, I absolutely recommend picking up a copy of Girls of Paper and Fire. Despite the fact that it wasn’t a perfect 10/10 for me, I know it’s the kind of story I will be recommending to friends for years to come because I think this book did so many things right at the end of the day. Thank you love! It wasn’t perfect but def worth picking up! i love this review so muchhhhhh!! ❤ ❤ I'm also an emotional reader, so I'm feeling nervous I won't enjoy this as muchh? Thank you lovely!! I knoooow, I was like QUEER GIRL REP?! HOW COULD I *NOT* LOVE THIS?! But… sigh. I hope it fares better for you than it did for me on the emotional aspect!! Great review!! I agree with a lot of your opinions on this book, and I loved your inclusion of quotes throughout your review. I actually just put up my review for this exact book a few minutes ago! Thank you! 🙂 Ooh, I’ll have to check yours out, too! I’m really keeping my fingers crossed the sequel is going to be even better. It’s often the case with debut authors anyway, so hopefully this time as well. Right, same! It’s really rare that I will totally write off a debut author. I have to either have HATED their book, or it has to have just been super problematic (and even then, I’ll SOMETIMES try another book of theirs if it’s several releases later, and see if they’ve learned from their mistakes). This sounds sooo promising! Hopefully the next one lives up to the promise entirely. The world building sounds great but, if the characters are hard to connect with I can totally see why this was hard to rate. Great review, Destiny! Thank you, love! ❤ Yeah, definitely just a bit of issue with the characters but the longer I think on this book, the more confident I feel that the sequel will fix those issues! Oooh, I hope you enjoy it! It was honestly a really enjoyable read and I think I like it even more now that I’ve had time to dwell on it a bit than I did when I first finished it! Thank you for this detailed review and going into your dislikes too. I’m excited to read this, but it’s good to know there might be some caveats! Aw, thank you for reading! I hope you enjoy it when you read it! Great review, I love your honesty! I think that weirdly Aoki was probably one of my favourite characters and I can’t quite put my finger on why – I think what you said in your review about her being so complex is likely why. Thank you! Yes, agreed for sure – she and Wren were definitely my favorites. I thought she was so complex and I felt so sorry for her, especially as someone who had been in that place before of letting a very toxic person convince me I was “special”; that’s a part of abuse that people don’t talk about much, and I thought she was a perfect example of it. I just wanted to hug her and keep her safe, haha!